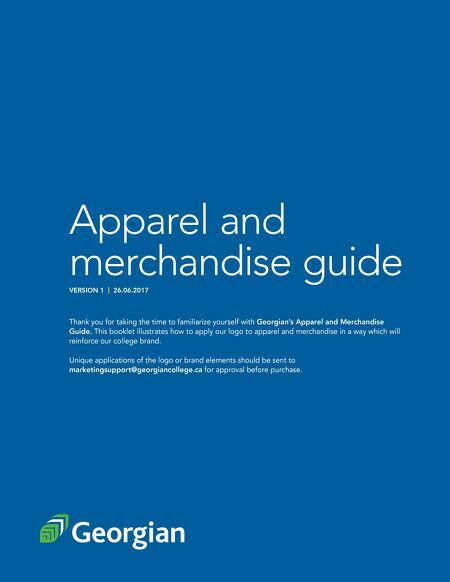 APPAREL AND MERCHANDISE GUIDE | DESIGN WITH US We love our logo treat in well Apparel and merchandise guide VERSION 1 | 26.06.2017 Thank you for taking the time to familiarize yourself with Georgian's Apparel and Merchandise Guide. This booklet illustrates how to apply our logo to apparel and merchandise in a way which will reinforce our college brand. Unique applications of the logo or brand elements should be sent to marketingsupport@georgiancollege.ca for approval before purchase.